At Red Beam Garage C, we cater to a variety of travelers. Whether you’re a business professional, a large family, a first-time traveler, a couple, or a solo adventurer, our fast, easy parking is the perfect way to start your trip. With a no-hassle parking process and affordable prices, you can enjoy your vacation even more. Unlike other Rhode Island Airport parking facilities that require extra travel time and crowded shuttles, Red Beam Garage C is easy to use. All you have to do is arrive at our facility, pull a ticket from the machine, and find an empty parking space. If you have a reservation, simply have your confirmation email available. Once you park your car, take your keys with you and head to PVD! It’s that easy! Our PVD Airport parking company is located adjacent to the airport and is just a three-minute covered walk to the terminal. This means as soon as you arrive, you can head right to your flight and won’t have to wait around to catch a shuttle. Simply park your car, grab your luggage, and go! Once you return, you’ll know exactly where to find us. 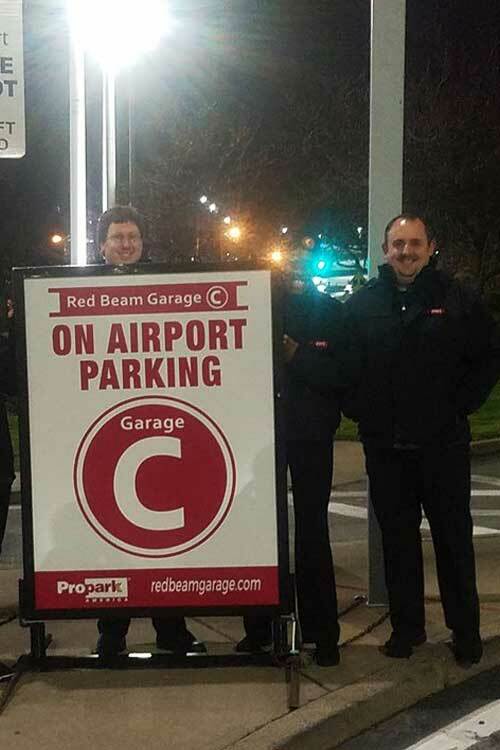 At Red Beam Garage C, we want to make your Rhode Island Airport parking experience as enjoyable as possible. Our garage is safe and well-lit to give you peace of mind while you’re here and while you’re away. We also offer state-of-the-art equipment that can scan standard or mobile barcodes to make check-in and check-out easy. And with friendly staff members available 24/7, we can offer assistance if you need it. We even offer a rewards program called Park for Peanuts that lets you earn points every time you park with us. Once you earn seven points, you’ll get a free day of PVD Airport parking! Park with Red Beam and discover how convenient it can be.